In uncertain times, many people look to take control of their futures, and owning a franchise is a possible solution. If that is the route you’d like to take, you’ll want to make sure the franchise you choose has a strong demand for its products and services no matter what the shape of the economy is. 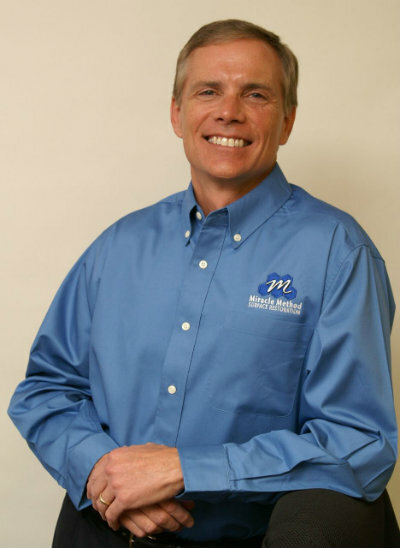 Chuck Pistor, President of Miracle Method. Owning your own Miracle Method franchise could be the business opportunity you’ve been looking for. “Our innovative proprietary MM-4 bonding agent, along with continued improvements to our technology and a commitment to the highest standards for quality and customer service have helped us become the best at what we do,” says Pistor. With 125 franchises, and growing, there are still a number of great markets available. We invite you to visit our website to learn more about Miracle Method franchise opportunities. And if you’re ready to join the nation’s largest surface refinishing network, use our online form to request information, or just give us a call at 800-444-8827. I’m tired of the dated look of my Corian countertops. Can they be refinished? Corian countertops are composed of man-made materials that make for great countertops, initially. As Corian is a solid surface, it’s easy-to-clean, stain and heat resistant, and seams are almost invisible. However, Corian countertops come in a limited selection of colors and patterns, and after a few years of use, your Corian countertops may cause your kitchen to look quite dated, which can make you ponder whether or not you need to replace the countertops all together, or remodel your entire kitchen. Fortunately, there’s an option that is quicker and more cost effective – surface refinishing from Miracle Method. In just a few days, your kitchen will look like new, and your old countertops will still be just as easy to clean, stain and heat resistant, and seams will still be almost invisible. As Miracle Method offers an almost unlimited amount of colors and patterns to choose from, dated countertops will be a thing of the past. Plus, if your old Corian countertops have ever been scratched or cut, the damage will be repaired, so you’ll never know it was there to begin with. If you’re ready to bring your Corian countertops into the present, visit our website to find the Miracle Method franchise closest to you, or give us a call at 855-212-7337. Don’t forget we also refinish other types of countertops, like Laminate, tile, and Formica. Can I afford to update my kitchen? Kitchen remodeling is a great way to refresh the look of your home and add value to it. However, kitchen remodeling projects tend to be very time consuming projects and can be rather costly. Given the uncertainty of the economy and tighter budgets, many homeowners aren’t able to afford a full-scale remodel and are looking for more affordable, cost-effective ways to update their kitchens. Refinishing with Miracle Method is a very affordable option for those who wish to update and improve the look of their kitchen. 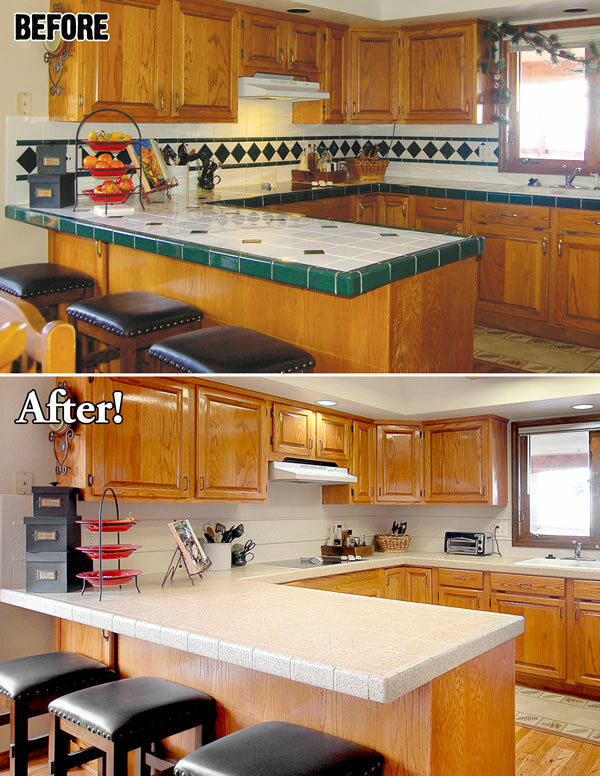 Refinishing old countertops generally saves homeowners between 30% and 50% over the total cost of replacement costs. In addition to saving money, the useful life of your countertops will be extended by as much as 15 years when you refinish, which will save you money in the long run, too. Best of all, our Natural Accents stone-like finishes are available in many attractive designer colors. Miracle Method has the ability refinish a wide variety of countertop surfaces, including ceramic tiles, laminates such as Formica, and even solid surfaces such as Corian. Visit our website today to learn more about how you can update your kitchen at an affordable price with Miracle Method, or use our online locator to find the Miracle Method franchise closest to you for a free estimate for countertop refinishing. My countertops need to be replaced, what are my options? When your kitchen countertops become outdated or damaged, it’s time to make a change. The first solution one might think of is to completely replace the countertops with a brand new surface such as Corian or Silestone. While new countertops may seem like a valid option, the replacement process takes up anywhere from seven days to a few weeks and is quite costly – and those factors alone may cause some consumers to re-think that decision. Another option is to refinish your old countertops. The Miracle Method process is a great option because refinishing repairs any damage and restores the existing surface to a like-new appearance, as well as extends the life of the countertops up to 15 years or more. Additionally, refinished kitchen countertops are repairable, guaranteed, and can be used in just a few days after refinishing. Miracle Method offers a wide selection of colors and texture options, so you can match your existing décor. You can also have the look of stone with Miracle Method’s revolutionary product called Natural Accents at a fraction of the cost of a real stone countertop. The biggest advantage of refinishing, by far, is the savings when compared to replacement. Countertop refinishing usually saves homeowners between 30% and 50% over the total cost of replacement! 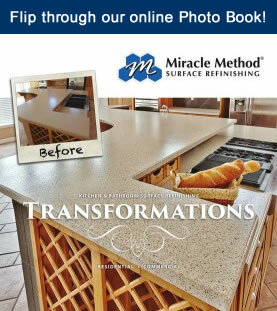 We invite you to visit the Miracle Method website to learn more about the option of countertop refinishing. And if you are ready to refinish with Miracle Method, use our online locator to find the Miracle Method franchise closest to you. Is a refinished countertop as durable as a laminate countertop? Laminate countertops have often been the material of choice for kitchen countertops because they are a non-porous surface that is easy to clean, comes in a wide variety of colors, and is resistant to heat and stains. 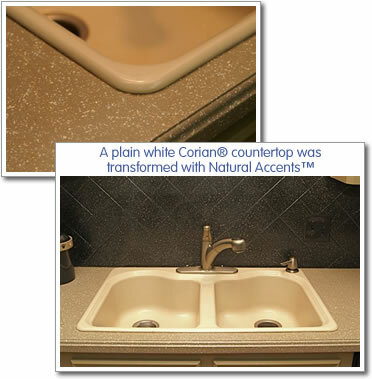 Laminate countertops are often marketed under brand names such as Formica and Wilsonart. While they are considered to be an economical choice, there are also a few disadvantages to laminate countertops. Laminate countertops can be cut, scratched, or even chipped and that type of damage isn’t easy to repair. Once a laminate countertop has been damaged, it becomes a great candidate for refinishing. If you like the look and layout of your laminate kitchen counters, refinishing is a way to completely restore them to a like-new condition and feel. With the Miracle Method refinishing process, you’ve got plenty of color and texture options available, so you can get a great new look for a fraction of the cost. While refinished countertops are comparable to laminate in that they are durable, non-porous, stain and heat resistant, unlike laminate, refinished countertops can be easily repaired if damage occurs. If you’re interested in having your laminate countertops refinished, visit our website to learn more about the innovative Miracle Method refinishing process. There you can also find a Miracle Method franchise near you, or you can give us a call at 855-212-7337.